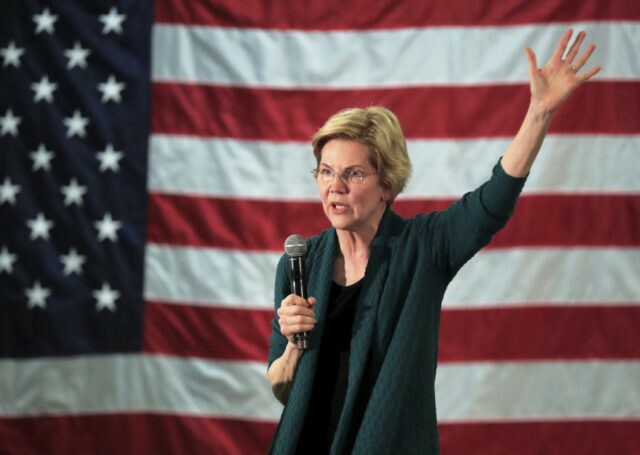 CNN hosted a town hall on Monday in Mississippi with presidential candidate and Senator Elizabeth Warren (D-MA) where she answered questions on a range of issues, including the Mississippi flag, which features in its field a Confederate symbol. “Mississippi’s the only state in the country that still has the Confederate battle emblem on the state flag — do you think Mississippi should adopt a new flag?” Jake Tapper, CNN anchor who moderated the town hall, asked Warren. “Warren replied with one word — ‘Yes’ — and was met with loud applause from the crowd,” CNN reported on its event. Adopted by the Mississippi Legislature in 1894. The thirteen stars sometimes said to represent the number of Confederate States and those that might have been Confederate, are said to represent the “original number of States of the Union” in the original description. “There has been a big push to remove Confederate monuments, memorials, and symbols after a white supremacist murdered nine African-Americans in a church in Charleston, South Carolina, in 2015,” CNN reported. As a presidential hopeful, do you have any plans on addressing the removal, or lack thereof, of the reminders of this nation’s dark past, or have any plans on preserving the nation’s history in a way that explains it in a more educational sense versus showing praise to the losing side? Warren was a co-sponsor for a bill in the 115th Congress sponsored by fellow Democratic presidential hopeful Sen. Corey Booker (D-NJ) that would remove any statues in the National Statuary Hall in the Capitol connected to the Confederacy. This bill amends the Revised Statutes of the United States to prohibit statues of certain persons who served voluntarily with the Confederate States of America from being displayed in National Statuary Hall in the U.S. Capitol. The Architect of the Capitol shall identify all such statues and, subject to the approval of the Joint Committee on the Library of Congress, arrange for their removal from the Capitol within 120 days. States may substitute statues in accordance with the requirements and procedures of the Revised Statutes and the Legislative Branch Appropriations Act, 2001. The bill makes appropriations for the activities in the bill. The bill never moved beyond being introduced.